This is the time of year where all things squash, pumpkin, and allspice seem to hit the shelves of the grocery store (and every other store for that matter!). Now, don’t get me wrong, I am not complaining. I love it, love it, love it! Fall is my favorite time of year, in part because I love the seasonal flavors. 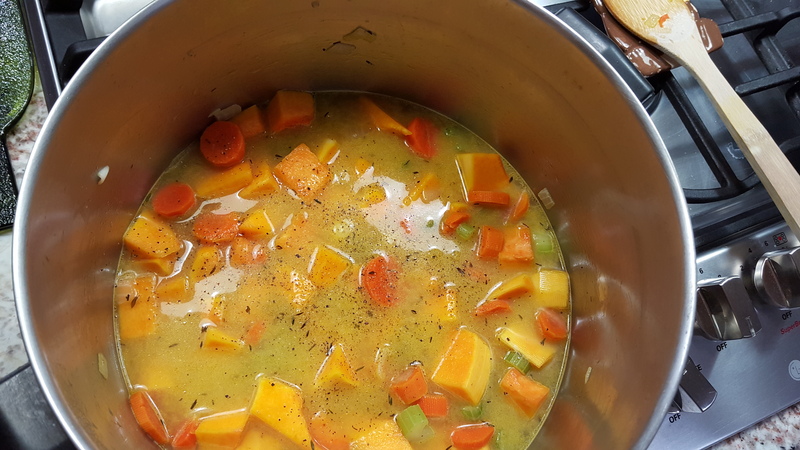 This soup is fairly easy to make (bonus) and full of vegetables (double bonus). It is creamy, but don’t be deceived – there’s no dairy in this recipe. And if you subscribe to a vegan lifestyle, no worries – just substitute coconut oil for the butter and vegetable broth for the chicken broth. Note, it is savory but with a mildly sweet finish (that’s because of the maple syrup and brown sugar). If you’re not sure if you like that, then be very modest when adding the syrup and sugar. I’d start with half of the syrup and adjust to your liking. For the brown sugar (or palm sugar), add one tablespoon at a time and adjust to your liking. Aside of the simmer time, prepping the vegetables takes a bit of time (all that slicing and dicing). 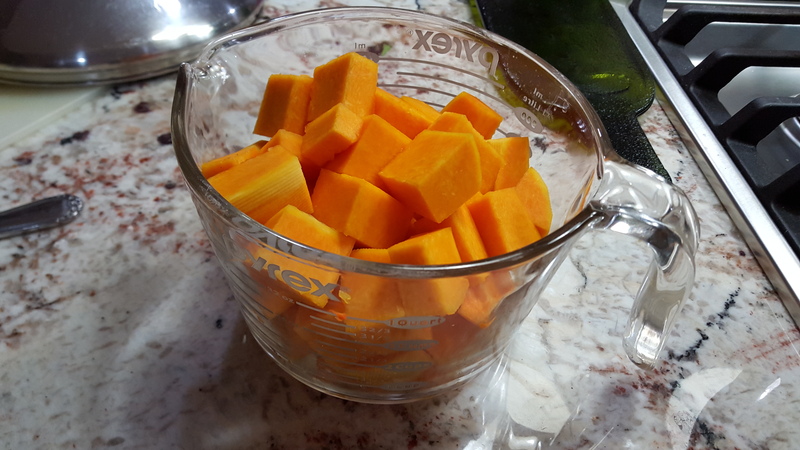 Slice the carrots about 2mm thick (1/8″) and cube the butternut squash into approximately 1″ cubes. In a large stock pot, melt the 2 T. of butter on medium-high heat. 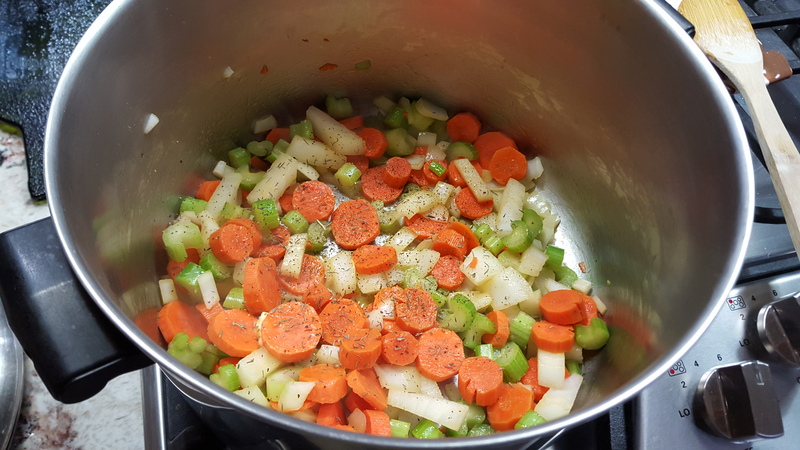 Add the carrots, celery, onion, salt, pepper, and thyme and cook for about 6 minutes. You want the vegetables to brown just slightly. Add the squash, broth, water, ginger and garlic. Simmer for 40-45 minutes on low heat. 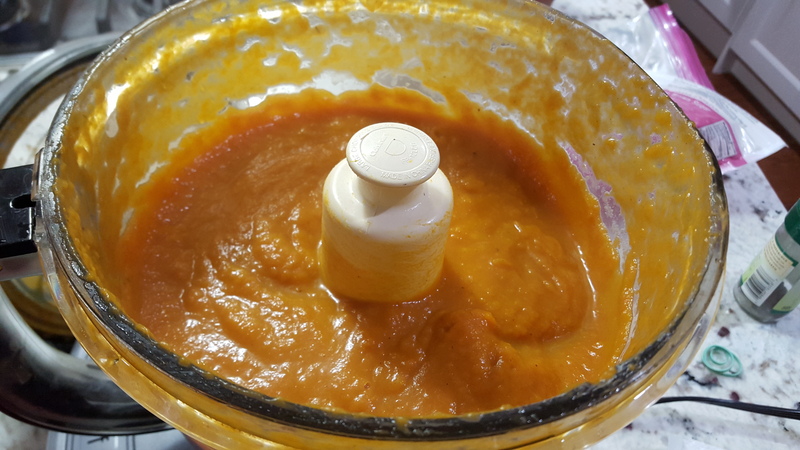 Once the vegetables are tender, drain the liquid into a pourable bowl or large measuring cup and set aside. 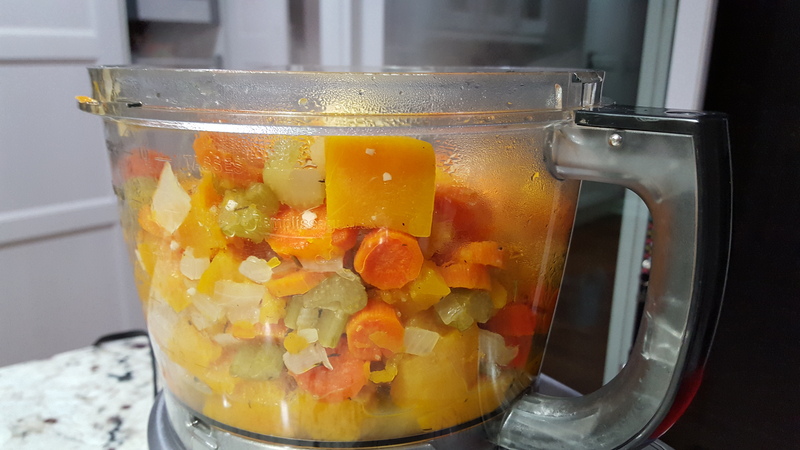 Transfer the vegetables into a food processor (or blender). Blend until the mixture is basically smooth. Now, add the coconut cream, maple syrup, allspice and brown sugar and mix well. 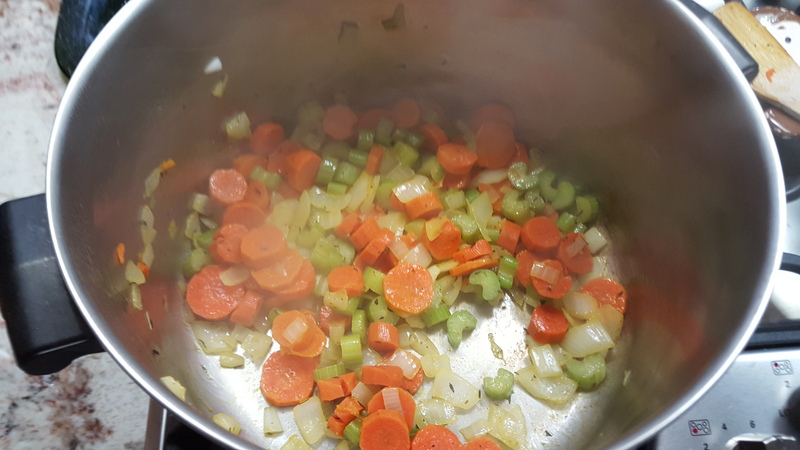 Finally, add the broth back into the soup one cup at a time, blending at least one minute between additions, until you reach the desired consistency. For me, that was about 2-3 cups of broth. Serve warm with a dollop of coconut cream and a sprinkle of ground allspice – and enjoy! 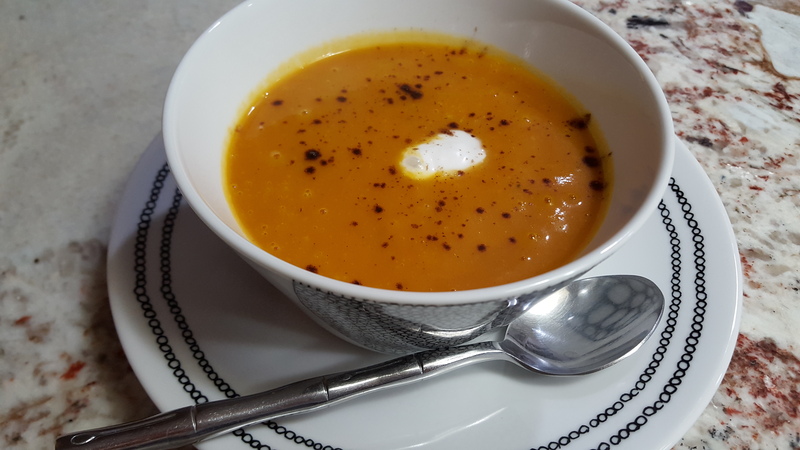 This entry was posted in appetizer, soup, vegetables and tagged allspice, broth, butternut squash, carrot, celery, coconut cream, ginger, gluten free, maple syrup, onion, paleo-friendly, soup, vegetarian. Bookmark the permalink.